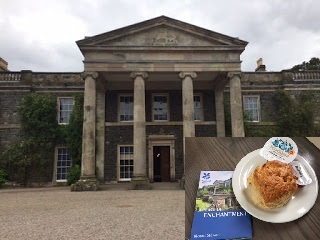 Last week I announced my Top National Trust Scones of 2017 - an impressive range of sconeage that I encountered across the land this year (including my first foray into Northern Ireland - hurray). But today it's the all-important one; the Sconepals have voted and I'm pleased to share the list of YOUR favourite National Trust scones of 2017. A total of 66 separate properties got at least one vote this year, which is great to see. However, there can only be one winner. Congratulations to all the team at Speke for another year of scone success. 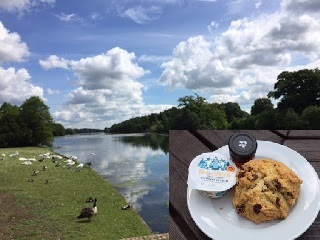 I had a fantastic time there - read about the Speke Hall scone. Well done to all of the National Trust baking teams across the land - you do a fantastic job keeping the ovens warm and the scones baking. Finally, I just want to say a heartfelt THANK YOU to everyone that voted and to everyone that has sent in pictures this year. Keep your scone snaps coming in 2018 - I love to see where you've been (and what you've eaten). Merry Christmas and Happy New Year everybody! See you in 2018 - with a fair wind this could be the year that I finish the National Trust Scone Odyssey! 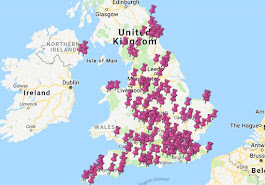 I got off to a blistering pace when I started this project to have a scone at every National Trust property; a staggering 52 properties visited in 2014, followed by 43 in 2015, and another 48 in 2016! Astonishing. But 2017 has been a tricky old year. 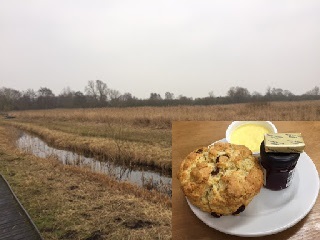 We only managed 13 NT visits in the past 12 months, which has me wondering if I will ever complete this National Trust Scone Odyssey. However, on the bright side, 6 of this year's properties provided top class scones, which means my hit rate has gone up. So although I am sad to only have a 'Top 6 NT Scones of 2017' instead of my usual Top 10 or Top 18, I am going to share it anyway. 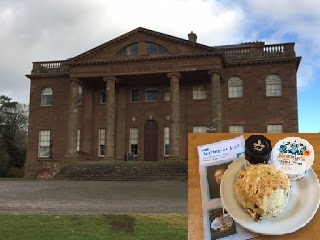 For, as the great Scarlett O'Hara almost said, "After all, tomorrow is another day for National Trust scone quests". So bring on the countdown for 2017! There is no doubt that many National Trust properties were built on the proceeds of other people's misery. Berrington's previous owners range from Thomas Harley, who had the contract to provide supplies to the British army in America ("in 1777 alone he supplied over 40,000 pairs of mittens") to Frederick Cawley, who owned the patent to a black dye that became very lucrative in 1901 when Queen Victoria died. But the scone wasn't miserable at all - it was extremely tasty. Mount Stewart, near Belfast, was once owned by Viscount Castlereagh - he was a fairly divisive character, to put it mildly, but you can read the full blog post to hear about this life and eventual suicide. The scone was delicious. I'm trying not to develop a theme of misery here, but Clumber Park does have its own sorry story - it was once the site of a magnificent house that was dismantled and sold off to pay a tax bill. But today it's a lovely park, with a walled garden, and 130 varieties of rhubarb. There was no rhubarb in the scone but it was fresh and lovely. Peckover doesn't have any misery attached to it, as long as you weren't a robber trying to gain unlawful access when it was a bank - you'd have got stuck in one of their man-traps, which are still on display. 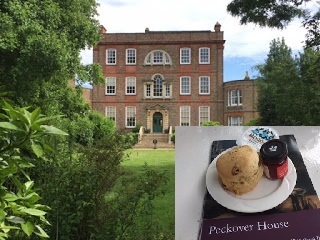 Peckover scones always get enthusiastic reviews from my fellow NT scone aficionados and mine was spectacular. Poor old Wicken Fen. We visited on a freezing February day when there wasn't much to see and everyone was cold and not very enthusiastic. And then we entered the cafe to find the scones were just coming out of the oven. They were divine. Everybody cheered up. The Needles Old Battery has been a missile testing site and a defence post in its time, but it gets its name from the jaggedy rock fin things that stick out of the sea. 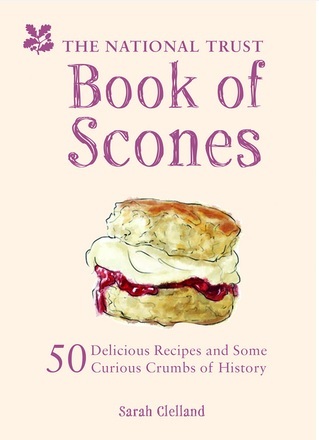 As of today, it can also lay claim to being the winner of the National Trust Scone Blogger's Scone of the Year. 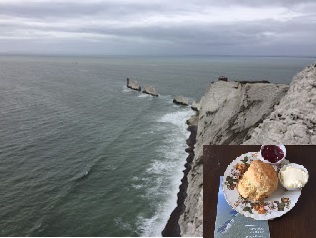 The scone can only be accessed by ferry, as it's on the Isle of Wight, but it is absolutely worth it; it was fresh and light and served in a lovely 1940s style tea room. Sublime. So that's all folks for 2017. Let's hope that 2018 brings another bumper crop of 5-star scones, although right now I'd take a few 4s as well. Maybe even a few 3.5s. Anyway. It only remains for me to wish all you fabulous Sconepals a Merry Christmas and a Happy New Year! Thank you for your continued support and KEEP SCONEING.